The Simplified Spelling Society is regularly featured in the Print and TV media. Parents and teachers are in the front line of Literacy for children. The American Spelling Bee contest encourages accuracy without comprehension and can be disregarded. The TES (Times Educational Supplement) and the THES (Higher) both refer frequently to the problem of illiteracy and spelling. Here are samples from one period, showing the media range and aspects of public interest in spelling. For several years, members of TESS from various countries, and members of the American Spelling Council, picketed the US Spelling Bee finals, drawing attention to the irregularity of English spelling. In 1934 the Chicago Sunday Tribune introduced a short list of revised spellings. The list was augmented and revised several times, but was mainly abandoned in 1955, after the death of editor advocate Robert L. McCormick. Here are explanatory articles from the Tribune and references to Burke Shipley's scholarly articles in Society Journals. 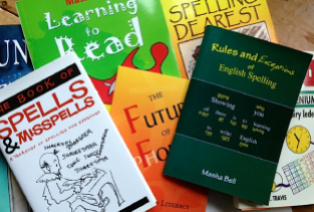 Extracts from articles, papers and books about dyslexia, published between 1997 and 2006, stating that the irregularities of English spelling cause more difficulties for dyslexic children and adults than opaque spelling systems. Extracts from, and references to, articles in the media, from all over the world, pointing out the irregularities of English spelling.